Are you a sucker for a morning glass of orange juice? If you do not have any stomach problems, it does not matter to drink orange juice in the morning. Drinking juice in the morning is a good choice because it is also a good source of vitamin C, thiamin, folate and potassium. Did you know which is better: Eating an orange or drinking orange juice? Oranges versus orange juice: Which one might be better for your health? Why does orange juice taste bad after you clean your teeth? What are the pros and cons of consuming Orange Fruit? Let's find the answer and learn more about Oranges! The orange (specifically, the sweet orange) is the fruit of the citrus species Citrus × sinensis in the family Rutaceae. The fruit of the Citrus × sinensis is considered a sweet orange, whereas the fruit of the Citrus × aurantium is considered a bitter orange. The sweet orange reproduces asexually (apomixis through nucellar embryony); varieties of sweet orange arise through mutations. What’s the Difference between Orange Fruit (Standard Orange), Mandarin Orange, Pomelo, Tangerines, and Clementines? + Orange Fruit (Sweet Orange/Standard Orange) is a hybrid, between pomelo (Citrus maxima) and mandarin orange (Citrus reticulata). It has genes that are ~25% pomelo and ~75% mandarin; however, it is not a simple backcrossed BC1 hybrid, but hybridized over multiple generations. The chloroplast genes, and therefore the maternal line, seem to be pomelo. The sweet orange has had its full genome sequenced. Earlier estimates of the percentage of pomelo genes varying from ~50% to 6% have been reported. Sweet oranges were mentioned in Chinese literature in 314 BC. As of 1987, orange trees were found to be the most cultivated fruit tree in the world. Orange trees are widely grown in tropical and subtropical climates for their sweet fruit. As of 2012, sweet oranges accounted for approximately 70% of citrus production. In 2013, 71.4 million metric tons of oranges were grown worldwide, production being highest in Brazil and the U.S. states of Florida and California. + A mandarin orange is a slightly smaller relative of the standard orange. Mandarins originated in China, hence the name. The mandarin orange (Citrus reticulata), also known as the mandarine, is a small citrus tree with fruit resembling other oranges. Mandarins are usually eaten plain or in fruit salads. Specifically reddish-orange mandarin cultivars can be marketed as tangerines, but this is not a botanical classification. Mandarins are smaller and less spherical than common oranges (which are a mandarin hybrid). The taste is considered less sour, as well as sweeter and stronger. A ripe mandarin is firm to slightly soft, heavy for its size, and pebbly-skinned. The peel is very thin, with very little bitter white mesocarp, so they are usually easier to peel and to split into segments. Hybrids generally have these traits to a lesser degree. + Tangerines arrived in Europe in the 1800's by way of North Africa, where a large varietal was grown in Morocco. Exported through the port of Tangier, the fruit became know as Tangerine. "Mandarin" and "tangerine" are two words for the same thing, technically Citrus reticulata Blanco. They're called mandarins because they were thought to be native to China; they're called tangerines because they were thought to have come from Tangiers. + Pomelo also known as Citrus maxima (or Citrus grandis), (Common names: pomelo, pummelo, pommelo, pamplemousse, shaddick, or shaddock) is a natural (non-hybrid) citrus fruit, with the appearance of a big grapefruit, native to South and Southeast Asia. + The clementine fruit is small and seedless, and has become very popular in the US. As it is sterile (no seeds), shoots need to be grafted onto other varietals. This varietal was created by a French missionary Marie-Clement Rodier in Algeria over 100 years ago. Oranges flavor may vary from sweet to sour. It tastes like citrus that's sweet depending on the ripeness of the orange. Orange fruit has a sweet-sour citric taste, juicy with bumpy texture, soft. Most people hate the taste of orange juice after they have brushed their teeth. But what turns the orange juice from tasty to bad? You tongue can detect different tastes. It detects salty, sweet, sour, bitter and umami. When you brush your teeth, the toothpaste becomes foamy. The foam is made by a chemical called sodium lauryl sulphate (SLS). SLS makes lots of foam and bubbles that make your teeth feel clean. SLS makes your sweet taste buds stop working so well. SLS also destroys fats that block your bitter taste buds. SLS hides the sweetness of orange juice and makes it taste bitterer. That's why it tastes horrible after brushing your teeth. SLS is in most toothpastes. Have a look at the ingredients and see if it's in the toothpaste you use. Which is better: Eating an orange or drinking orange juice? Oranges versus orange juice: Which one might be better for your health? According to American Chemical Society published in 2015 about Journal of Agricultural and Food Chemistry, "In Vitro Bioaccessibility of Carotenoids, Flavonoids, and Vitamin C from Differently Processed Oranges and Orange Juices [Citrus sinensis (L.) Osbeck]"
Many health advocates advise people to eat an orange and drink water rather than opt for a serving of sugary juice. But in ACS’ Journal of Agricultural and Food Chemistry, scientists report that the picture is not clear-cut. Although juice is indeed high in sugar, the scientists found that certain nutrients in orange juice might be easier for the body to absorb than when a person consumes them from unprocessed fruit. Ralf Schweiggert, Julian Aschoff and colleagues note that oranges are packed with nutrients such as carotenoids and flavonoids that, among other benefits, can potentially help lower a person’s risk for certain cancers and cardiovascular disease. But many people prefer to drink a glass of orange juice rather than eat the fruit. Sugar content aside, are they getting the same nutritional benefits? Schweiggert’s team set out to answer that question. > 1 medium raw orange contains about 62 calories. > 1 cup of raw orange sections has about 85 calories. > 1 cup of fresh squeezed orange juice contains 112 calories. > 1 cup of canned unsweetened juice contains 105 calories. > 1 cup of orange juice prepared from frozen concentrate, unsweetened and diluted with three parts water, has about 112 calories. Orange Nutrients. An average orange contains approximately 70 mg of vitamin C, which is over 75 percent of the recommended daily value. This vitamin acts as an antioxidant that inhibits the damage caused by free radicals, which are oxidizing molecules formed by natural processes, such as digestion. Vitamin C also aids in the body's healing process and helps to form and repair skin, tendons, ligaments and bones. 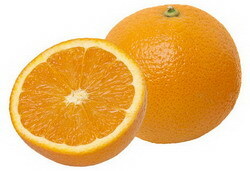 Oranges are also a good source of dietary fiber, vitamin B1 and folate. Oranges are relatively low in calories and an excellent source of various vitamins and nutrients, especially vitamin C. Orange juice provides more vitamin C than the whole fruit, but contains less dietary fiber. As with other citrus fruits, orange pulp is an excellent source of vitamin C, providing 64% of the Daily Value in a 100 g serving. Numerous other essential nutrients are present in low amounts. An orange does not top the list of fruits for vitamin C content. Guava, kiwi fruit, or a cup of strawberries have more vitamin C than an orange. Being a citrus fruit, the orange is acidic: its pH levels are as low as 2.9, and as high as 4.0. The nutritional benefits of oranges are numerous. The high content of vitamin C plays a significant role in protecting the immune system and reduces the risk of cancer, heart disease, cataracts, gout and stroke according to the Linus Pauling Institute. Other indicated health benefits of oranges include helping prevent ulcers and kidney stones, lowering cholesterol and reducing severity of various inflammatory diseases such as rheumatoid arthritis, osteoarthritis and asthma. Fully ripened oranges contain the most antioxidants. + Provide Vitamin C. Vitamin C cannot be synthesized by the human body so we must ingest it in our food and drink. Drinking two glasses of orange juice each day can increase the Vitamin C concentration in your body by 40 to 64 percent. The vitamin C we get from orange juice protects our bodies from the harmful effects of free radicals that cause early aging, and aids in the absorption of essential minerals like calcium. + Protects against Inflammation. Eating meals with a lot of fat or glucose can lead to the development of inflammatory reactions. Inflammatory reactions lead to the resistance of insulin, which is a common cause of type II diabetes and atherosclerosis. Atherosclerosis is a very serious condition where the blood vessel walls harden due to fatty deposits. Drinking orange juice when ingesting a high-carbohydrate and high-fat meal will prevent the occurrence of this inflammation, making it a good preventative measure against insulin resistance and atherosclerosis. + Balance Blood Pressure. You can improve your diastolic blood pressure by adding a glass of orange juice into your diet. Studies have found that orange juice contains hesperidin, a very healthy, water-soluble plant pigment. It improves the activity of small blood vessels bringing your overall blood pressure into balance and helping to decrease cardiovascular risks. + Decreases Bad Cholesterol. Drinking orange juice regularly is thought to decrease levels of low-density lipoprotein, or LDL, cholesterol. LDL cholesterol is commonly known as the “bad” cholesterol and it collects in your arteries and blood vessels, causing heart problems, cardiovascular issues, and problems with healthy blood and blood oxygen flow. The mechanism in drinking orange juice that is behind the improvement in LDL cholesterol levels is still unknown. More studies and clinical trials will need to be performed in order to hammer this out as concrete fact. + Promote Skin Condition. Drinking orange juice is said to bring a radiant glow to your skin and provide other skin benefits as well. Drinking this juice will help to hydrate skin and keep it firm. Using this juice as a topical treatment does wonders for the skin as well. It cleans out and tightens clogged pores and is believed to prevent wrinkles and fine lines. Orange juice is also a great natural remedy for treating sunburns. + Prevent Neural Tube Defects. Folate deficiency is one of the main causes of low birth weight and neural tube defects, which are congenital problems in the brain and spinal cord. It also one of the most preventable causes of these birth defects. Drinking ? cup of orange juice each day provides 40 mcg of folates to expectant mothers. Folates are important micronutrients that are known to prevent a wide variety of birth defects. The ? cup serving mentioned provides 10% of the recommended daily value of folates. + Produce Collagen. Vitamin C is the key ingredient for healthy production of collagen, which is the structural component of bones, tendons, ligaments and blood vessels. When the body is deficient in vitamin C it can lead to scurvy, a disease characterized by bruising, bleeding, tooth loss and immense joint pain. In order to prevent occurrences of scurvy it is recommended for an adult to take in at least 90 mg of vitamin C each day. Those who smoke may need to take in as much as 125 mg per day. Taking in these amounts should be easy as one 6 oz. glass of orange can provide up to 93 mg of vitamin C.
+ Other Benefits. The Vitamin B6 found in orange juice aids in the production of hemoglobin. Beta carotene from orange juice can help prevent cell damage. Orange juice has quite a bit of calcium in it, too. This helps promote bone health and strengthen teeth. Folic acids in orange juice help boost brain, spinal cord and neural system health. It has also been found that orange juice is highly beneficial to weight loss. + Orange juice is obtained by squeezing the fruit on a special tool (a juicer or squeezer) and collecting the juice in a tray underneath. This can be made at home or, on a much larger scale, industrially. Brazil is the largest producer of orange juice in the world, followed by the United States, where it is one of the commodities traded on the New York Board of Trade. + Frozen orange juice concentrate is made from freshly squeezed and filtered orange juice. Sweet orange oil is a by-product of the juice industry produced by pressing the peel. It is used for flavoring food and drinks and also in the perfume industry and aromatherapy for its fragrance. Sweet orange oil consists of approximately 90% D-limonene, a solvent used in various household chemicals, such as wood conditioners for furniture and—along with other citrus oils—detergents and hand cleansers. It is an efficient cleaning agent with a pleasant smell, promoted for being environmentally friendly and therefore, preferable to petrochemicals. D-limonene is, however, classified from slightly toxic to humans, to very toxic to marine life in different countries. The sweet orange fruit can be eaten fresh, or processed for its juice or fragrant peel. Oranges, whose flavor may vary from sweet to sour, are commonly peeled and eaten fresh or squeezed for juice. The thick bitter rind is usually discarded, but can be processed into animal feed by desiccation, using pressure and heat. It also is used in certain recipes as a food flavoring or garnish. The outermost layer of the rind can be thinly grated with a zester to produce orange zest. Zest is popular in cooking because it contains oils and has a strong flavor similar to that of the orange pulp. The white part of the rind, including the pith, is a source of pectin and has nearly the same amount of vitamin C as the flesh and other nutrients. Mandarin oranges are generally peeled and eaten fresh. The fresh fruit is also used in salads, desserts and main dishes. Fresh tangerine juice and frozen juice concentrate are commonly available in the United States. The number of seeds in each segment (carpel) varies greatly. Mandarins Peel is used fresh, whole or zested, or dried as chenpi. It can be used as a spice for cooking, baking, drinks, or candy. After reading the whole article, now you have knowledge about orange, side effects of eating oranges, the difference between Orange Fruit (Standard Orange), Mandarin Orange, Pomelo, Tangerines, and Clementines, orange recipes and many more. You might also want to learn more about other healthy fruit with high vitamin C content such as strawberries. 0 comments on "Orange Fruit Health Benefits, Nutrition, Pros, and Cons"